The far-right president of Colombia’s senate blamed his printer for the removal of key parts of a bill that seeks to regulate the competencies of the country’s war crimes tribunal. House President Alejandro Carlos Chacon (Liberal Party) returned the bill to Senator Ernesto Macias (Democratic Center), an outspoken opponent of an ongoing peace process with demobilized FARC guerrillas, claiming the bill had been altered. While the Special Jurisdiction for Peace has been in force for over the year, the bill that ought to regulate the transitional court’s competencies has been unable to pass through Congress. No high school education, can’t manage a printer? The removal of the part of the bill that defined the court’s duties to “guarantee victim’s rights” and “contribute to a lasting peace” were removed when Macias, who allegedly falsified his high school diploma, printed the document. When [bills] are to be sent to the Presidency for sanction, the format is changed on paper. It is a special paper that is predetermined for the bills that are sent to the Presidency of the Republic. When printing, because of the configuration of the printers, it happens frequently that there are double spaces, that the configuration changes and this happened. 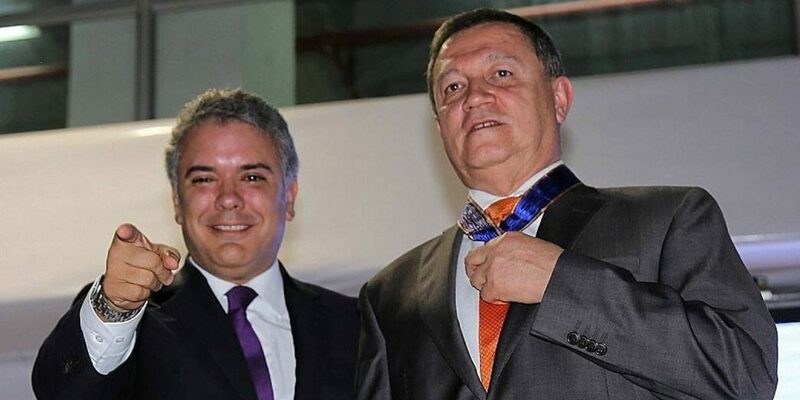 Can Duque block the bill? In the two years of the peace process, Duque and his hard-right party have gone at lengths to sink the war crimes tribunal, limit its powers and discredit the court with disinformation. Few believe Macias’ version of events and believe that the senate president was purposely trying to frustrate the ratification of the bill. According to former Interior Minister Guillermo Rivera (Liberal Party), “it is evident” that Macias tried to delay the ratification of the bill, adding concerns that Duque could refuse to ratify the bill, effectively leaving the war crimes tribunal in a legal limbo. Rivera’s successor, Nancy Patricia Gutierrez, told press that Duque would “verify the convenience” of the bill that defines the powers and the limits of the war crimes tribunal. “What would be even more serious is that rumors are confirmed that the president will object it. There exist no record of a presidential objection to a statutory law,” Rivera said. The bill is highly inconvenient for the president as at least one top official could be called before to court to respond to war crimes allegations. Multiple of the president’s closest political allies have been ties to war crimes that were committed during the country’s 55 years of armed conflict. The UN on multiple occasions has urged the government and congress to secure the court is able to operate. More than two years after the historic peace deal that allowed the demobilization of the country’s largest guerrilla group, the FARC, this is still uncertain.